In the previous installment covering news on the Woolwich ferry upgrade I discussed the new automated mooring system for the ferry. To some it may have seemed the idea of a magnetic mooring system was a bit far fetched. 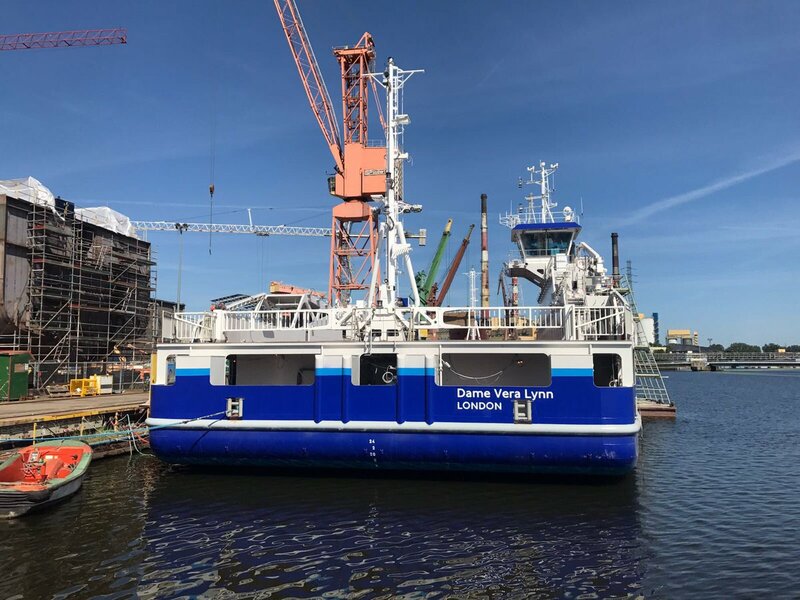 More information has emerged to show this new innovation is indeed the system being pursued and its the first ever use of a magnetic mooring system for any ferry in the world. This week the first pictures of the magnetic mooring piers were seen on Twitter. A video showing computer rendering of the new equipment and its operation has also been released however few knew of this. The video is embedded on this page. Its an interesting video and sums up in a nutshell what the new system is all about. I have used a few screencaps from this video to illustrate some aspects of the new system. The video showing the new intelligent Dock Locking System. The new pontoons and magnetic arrays were initially berthed at Frog Island, Rainham, in East London. The latest is the pontoons have gone to King George V dock for additional fitting out (see the new picture below.) 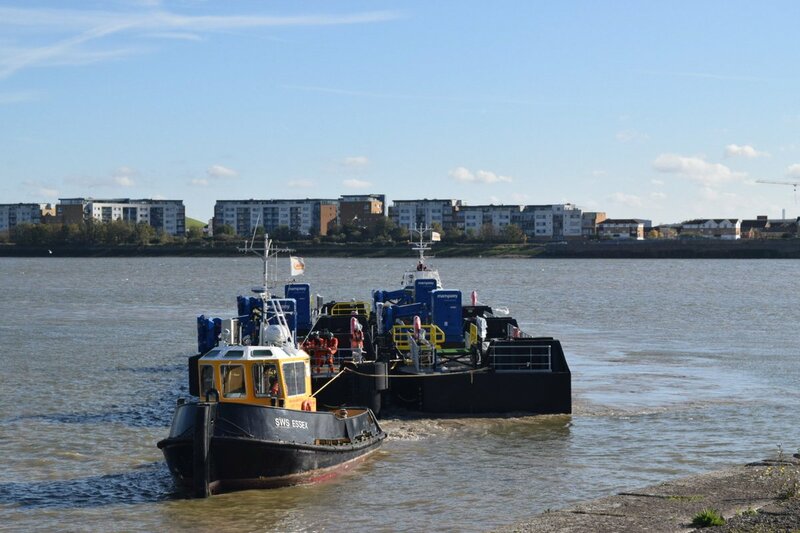 These will be moved to the Woolwich ferry terminals once other works have been undertaken, including removal of the old piers and dredging of the river bed. As the video shows, Mampaey’s intelligent Dock Locking System consists of powerful magnets to moor the ferries safely. The magnetic mooring dolphin (the blue box with magnetic array on a hydraulic arm) nearest the camera is for Woolwich, those on the outer are for North Woolwich and are are numbered three and four as can be seen. The nearest magnetic mooring dolphin seen in the above picture is number one. Its magnetic array is quite clearly seen. Along with number two (out of sight) these are for the Woolwich terminal. There are two elements to the new piers system. This consists of two floating pontoons, a smaller one which is positioned beneath the lifting ramps – the original dolphins designed for the 1960s ferries are too far inset. The larger pontoons to be placed alongside have the ‘intelligent Dock Locking System’ which consists of the blue painted magnetic mooring dolphins. I’ve used this clip from the video to show the position of the smaller pontoons which can be seen in the Twitter pics. Computer rendering from the video showing MV Ben Woollacott alongside the new magnetic mooring piers. The advanced technology means the new ferries can be worked by a crew of five. There will be a pool of nine for each ferry, with some duties involving both onshore and off shore roles. For example, as I understand it (correct me if I am wrong) – there will be just one engineer on duty for the pair of ferries (as opposed to two previously, one for each ferry.) Clearly they are confident the new technology will look after itself with computers monitoring and analysing every aspect of the boats, from their propulsion systems to the mooring piers and the engineer, for example, will be onshore attending to other tasks but will also by way of computers and communications know the state of the ferries and the piers as these work through their day, and intervene if any issues arise. Although no details have been published I think the new workforce requirement is probably just over half that for the old ferries. For the first time the ultra-modern bridge on the new Woolwich ferries is depicted in the video. 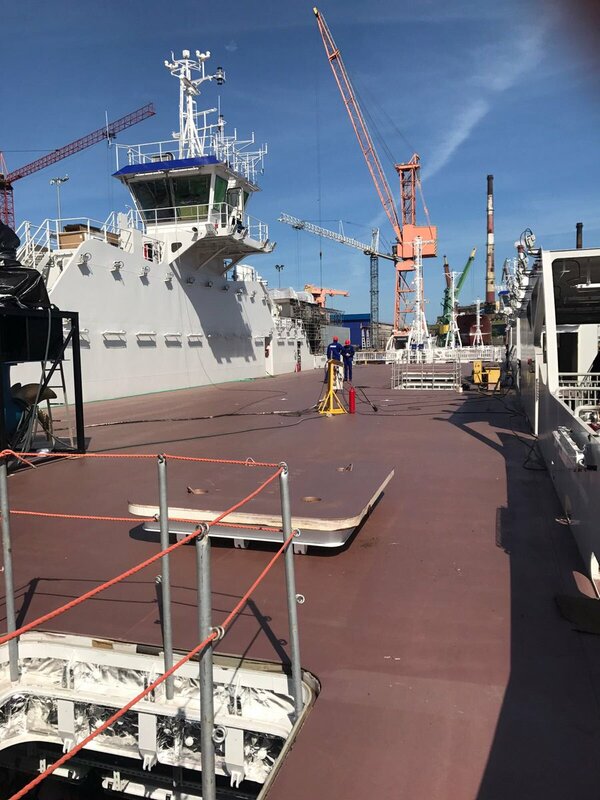 As the following pictures show, the new ferries are still berthed at the Remontowa yard in Gdansk. They have undertaken sea going trials in readiness for their long journey to Britain. I think they will make the journey to Tilbury soon, where they will be available for further fitting out and staff training in readiness for the new services probably December or January. Some may have seen the news the hi-tec ferry is now on its way to the UK. Tweets showed it sailing through the Kiel Canal a few days ago. There are a number of players in this modernisation scheme. The main ones are: Hydac whose vectored hydraulics come as part of the new magnetic mooring terminals; Hydromaster for the propulsion systems; Robert West for the feasibility studies; Mampaey for the intelligent Dock Locking System; Norwegian Electric Systems for the electrical aspects of the new propulsion system; Remontowa for the new ferries; Walsh & Sons Ltd for the storage and delivery of the new piers and other infrastructure.